The online peer review journal, Blockchain in Healthcare Today (BHTY), has published its first articles to augment the industry’s knowledge-base. The announcement of the journal came last June, when the Founder of Partners in Digital Health, Tory Cenaj, announced the launch of a journal focusing exclusively on blockchain technology for the healthcare marketplace. “I’m very proud of the collaborative efforts of the board, quality of submissions, and market reception,” stated Tory Cenaj, Founder and Publisher of BHTY. “It’s an initiative that requires passion, teamwork, and dedication. My intent is that the journal accelerates an informed discussion that builds a new framework for patient care, and backbone for a new health system. Technology is exciting, but it must come full circle with proven outcomes and definitive financial implications for both patient and health system. That must surface next – and we will look for it in future manuscript submissions,” asserted Ms. Cenaj. “Virtually every healthcare technology startup is including blockchain in their business plan as if were pixie dust—a magical panacea that solves all workflow problems. Our new peer reviewed journal explores the successes and failures of blockchain in healthcare so that technologists, investors, and policymakers can understand what innovations make sense and which are just hype,” said John Halamka, MD, who is Editor-in-Chief, BHTY and Chief Information Officer, Beth Israel Deaconess System, Chairman, New England Healthcare Exchange Network (NEHEN), and International Healthcare Innovation Professor, Harvard Medical School. In addition, you will find a Letter from Editor-in-Chief, John Halamka, MD, and a Publisher’s Note, by Tory Cenaj. The journal marks a historic milestone for scholarly publication in blockchain health technology around the globe. “Blockchain in Healthcare Today offers tremendous potential but suffers from broad misunderstanding and a lack of systematic approaches. I can’t imagine a more worthy or exciting endeavor than with BHTY to help identify and disseminate where genuine value exists for this disruptive technology… While it may be philosophically counterintuitive to centralize a source of truth about its potential, I think BHTY aspires to be a responsible steward and curator. I was impressed by the caliber of the BHTY editorial board—specifically its balance of innovation and pragmatism,” stated Kevin Clauson, BHTY editorial board steward and Associate Professor, Lipscomb University College of Pharmacy & Health Sciences, Nashville, Tennessee. Blockchain in Healthcare Today is an open-access publication that publishes methodologies, pilots, and scalable and sustainable blockchain deployments, exclusively, in the healthcare ecosystem. The Journal offers rapid, peer-review publication of research, commentary, and proof of concept for blockchain technology and related areas. No subscription fees are paid to view content or to subscribe/register with the journal. “Our focus in healthcare has always been to create citizen-focused data infrastructure, where the citizen plays an active part in their own care. We believe that blockchain and enhanced cryptography methods can be used to rebuild our healthcare infrastructures in a more trust worthy way. 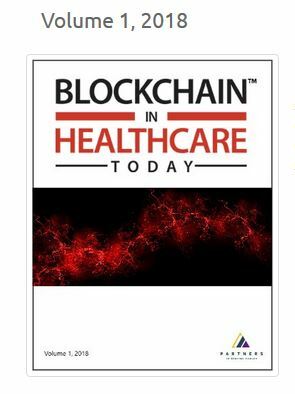 The Journal thus provides a great foundation for discussion around how blockchain technologies can be used to improve patient safety, while opening up new opportunities for social and economic development…for all the key stakeholders to discuss ways of sharing knowledge, and in defining best practice,” Bill Buchannan, OBE, BHTY board member and Professor, School of Computing, Edinburgh Napier University; Fellow, BCS and IET. Blockchain in Healthcare Today publishes articles on a continuous basis. As articles are accepted, they are published to ensure timely and accurate reflections of trusted open source developments to assist building rapid consensus and adoption by the community. To submit an original manuscript to BHTY, register first, then upload your manuscript submission at https://blockchainhealthcaretoday.com/index.php/journal/user/register. Blockchain in Healthcare Today (BHTY), is an open access online peer review journal where collaborative efforts of thought leaders and innovators converge to find solutions in a dynamic blockchain health technology sector. Blockchain in Healthcare Today provides objective evaluation of methodologies, pilots, and scalable and sustainable blockchain deployments, exclusively, in the healthcare ecosystem. Blockchain in Healthcare Today offers rapid, peer-review (5-7 days) publication of research, commentary, and proof of concept for blockchain technology and related areas that catalyze a new era in healthcare. Manuscripts of interest will present or establish advances in this new health sector or demonstrate the financial impact to the healthcare system and patient care, utilizing evidence-based outcomes that advance value-based healthcare across the care continuum. The BHTY audience includes blockchain and healthcare executives, researchers, and innovators at institutional, academic, public health, government, biopharma, health insurance, not-for-profit organizations, FinTech, and VCs with an interest in the latest knowledge on blockchain technology, implementation, and advances on the horizon in healthcare. To subscribe for future article alerts, it’s FREE, click here.